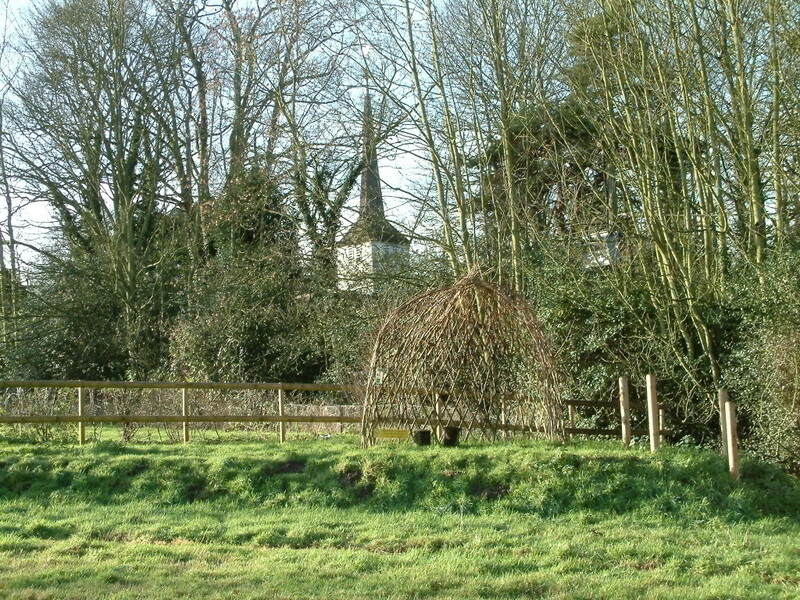 This 1.3 acre field was given to St Mary’s Church by the Courage family early in the last century for eventual use as a graveyard. In 2005, recognising that we would not need the site for this purpose for many years to come, we asked for ideas about how the meadow could be used for more immediate community benefit, and the idea of the Butterfly Meadow was born. Today it is a significant nature conservation area.The Meadow was designed by Stephen Hall, local resident and Chelsea Flower Show award winner. Surrounded by mature trees, it includes a large area planted with wild flowers to attract butterflies, claybound gravel paths, living willow tunnels and domes, and benches with engraved plates for brass rubbing. There is a central maze with beetle banks, and ananalemmatic sundial enabling visitors to tell the time using their own shadows. You will also find a classroom seat in the shape of a butterfly, an area of ornamental trees to attract songbirds, log piles for insects, and bird feeding stations. Staff and pupils from St Mary’s School and other local residents use the Meadow for educational and artistic purposes, and assist in its care and management.We invite you to take time to explore our Butterfly Meadow, to discover the features mentioned above, and to enjoy this special place.We acknowledge with gratitude major donations towards the construction of the Butterfly Meadow from the Essex Environment Trust and WREN (Waste Recycling Environmental Ltd), as well as generous gifts from parishioners and others. We are also grateful for many hours of voluntary labour donated by employees of Ford Motor Company, by members of Shenfield Garden Society and the Writtle Neighbourhood Gardeners’ Scheme, and by many local residents.